If I recall from the tour I took of this building last year, the locker room scenes from Bull Durham were actually filmed in this building. It's an interesting building if you get a chance to see it. There are huge doors that were designed to automatically seal off a room if a fire broke out. After walking by portions of the Measurement Inc. complex a few times, I noticed the new lampposts they have (there are a couple in your second-to-last picture) could be considered to have a stylized "M" at the top. I wonder if it's just coincidence? You are right - they showed us a stairway in this building that was part of the movie. I was very impressed with MI's interior renovation. I had never noticed the 'M' before, but it does seem awfully coincidental, doesn't it? Nice pick up. Yes -- I can confirm the artist loft space in the 1990s. A friend got involved in amateur theatricals, and at a certain point had to lug scenery from one part of this building to the space they were using. Later, they did a few performances there. I sat through their dramatization of Spoon River Anthology, I believe. A slight correction to that previous post. As I recall now, the final performance was at the Durham Arts Council bldg, although scenery & rehersals were in the Imperial bldg. My father worked there in the 50s and 60s, and I remember all the great things about that building, and carr, and morehead, and durham high, and the great people who I grew up with, for the old times. The Imperial Tobacco Company of Great Britain and Ireland was established by 18 individual British tobacco manufacturers who wanted to counter JB Duke's expansion of the American Tobacco Company into Europe. 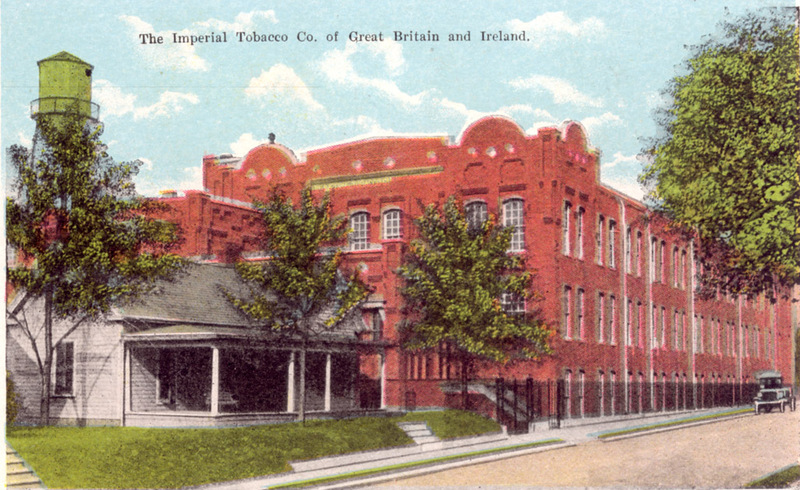 After Duke purchased a British tobacco factory and began undercutting the British manufacturers, the Imperial Tobacco Company announced plans to establish an American market for themselves. This led to an agreement between Duke and Imperial, in which Duke agreed to sell his British factory to Imperial in return for Imperial not entering the American market. However, in order to cut their costs in the European market, Imperial sought to establish their own leaf-buying organization in the United States, and by 1903 was associated with Fallon and Martin in Durham. 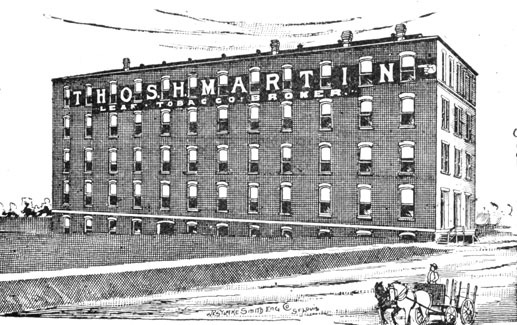 Thomas Martin was one of many independent tobacco buyer/brokers in Durham who sold tobacco throughout the country during latter portion of the 19th century. This five-story building had built during the 1890s. In 1908, Imperial bought Fallon and Martin, retaining Fallon to run their operations. The Fallon and Martin Factory became the Imperial Tobacco Company factory. Looking northwest on Morris St. But these buildings burned in 1915. In 1915-16, the company rebuilt a factory on the same site - on Morris St. between Morgan and Fernway. View of the new Imperial Tobacco Factory, 1920s, looking northwest. (As an aside, if you look closely in this shot, you can see the Brodie Duke homeplace on the grounds of Durham High/Carr Junior High. I hadn't realized until seeing this picture that they co-existed.) You can also see that the water tower remains from the old factory. View from Morris St., looking northwest, 1920s. 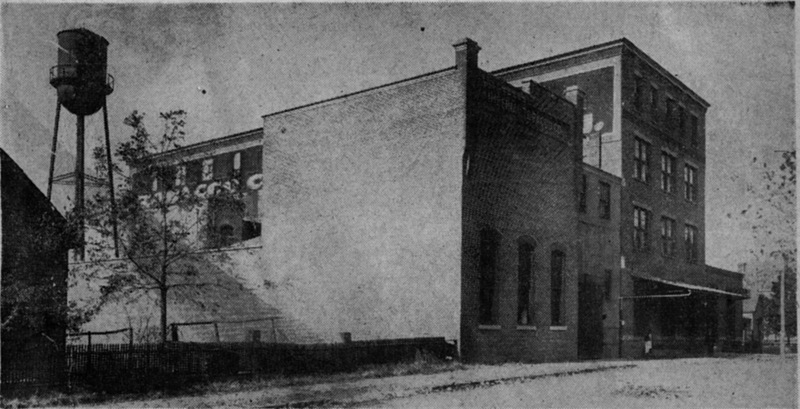 Rear of the building, from Morris and Fernway, looking southwest. The Romanesque Revival building is similar to others that Imperial Tobacco built in Richmond and South Carolina. The factory operated throughout the early to mid 20th century. In 1962, the company built a new, modern facility in Wilson, NC, but maintained some operations at the Durham plant. A rather odd shot (try to ignore the cars) of the Imperial Tobacco Factory from Morris and Morgan, looking northwest, 1963. In 1965, the company sold the building to the DC May decorating company, previously profiled in the 400 block of Morgan St.
From Morris St., looking northwest, mid-1970s. Looking northwest, 1981; the DC May company, manufacturer of building and painting supplies, moved to this building after their building on Morgan St. was torn down by urban renewal. The building contained space for numerous tenants, and I believe had artist loft space in it during the 1990s. In 2003, D.C. May Corp closed its factory in downtown Durham as part of a combination with two other companies and sold the building to Measurement Inc., an educational testing service. Per the News and Observer "Most of the plant's 120 workers lost their jobs, although David May, president of D.C. May, said that about 20 workers may end up transferring to the company's new plant in Manning, S.C."
In 2005, Measurement Incorporated renovated the building as part of the expansion of their testing services company, and did an excellent job with the renovation.